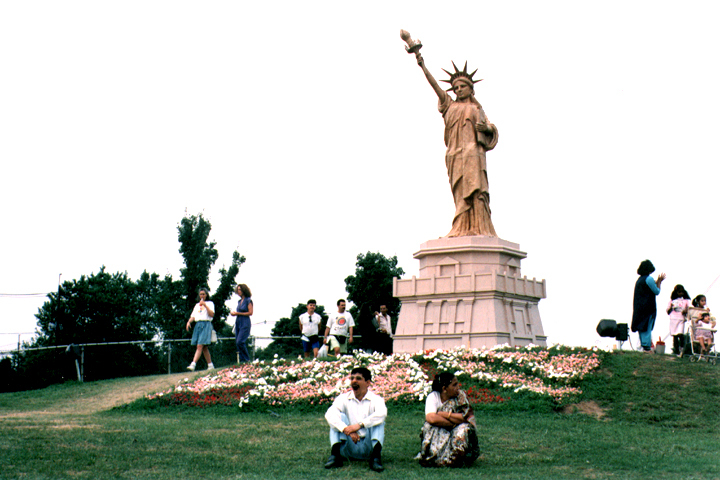 During the 1960s and 1970s, students and professionals from India were attracted to America by new policies which encouraged the immigration of professionals. Since the worship and rituals of the Hindu tradition are largely performed at home, the small altars of Hindu homes and apartments were surely the first altars where Shiva, Vishnu, Ganesha, and Devi were worshipped in such places as Chicago and Houston. For more communal worship, the “Hare Krishna” temples and Vedanta Societies became a welcome, if often temporary, home for newly arrived students and immigrant Hindus. Many of the Hindu students and professionals who came to the United States in the late 1960s and 1970s thought of themselves, at first, as temporary residents. They were here to get an education or to get started on a career, work for a few years, and then return home. By the mid-seventies many of these immigrant couples had successful careers and children in grade school. It became clear that they would not return to India, at least not soon. If their children were to retain anything of their Hindu heritage, these young professionals would have to take active steps to create the centers and temples where that heritage could be tasted by the new generation. Among the first groups to emerge were regional associations of Tamils, Gujaratis, or Bengalis, formed to provide a context in which the language, dance, music, and festivals of the various regions of India might be enjoyed and introduced to the next generation. The Gujarati Association would meet to celebrate Divali and enjoy an evening of garba dancing. The Marathi Mandal would rent a hall for the observance of Ganesha Chaturthi. The Bengali Association would sponsor a gala observance of Durga Puja. Beginning especially in the 1970s, these regional associations proliferated in every cosmopolitan American city. By 1995 there were, for example, dozens of different kinds of Indian cultural associations in Dallas. National associations also emerged, each with its pattern of national summer conferences—the American Telugu Association and the Orissa Society of America, for example. Many of these cultural associations are not specifically “Hindu,” but they are implicitly so. For example, the Association of Indians in America (AIA) held a Divali observance at South Street Seaport in New York City in 1995. 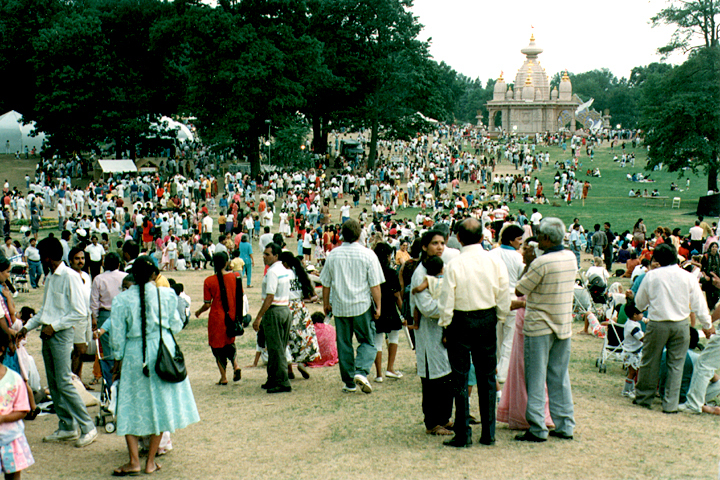 More than 85,000 people came during the day-long celebration, which featured a drama from the Ramayana. The early post-1965 Hindu immigrants met in rented halls and churches for festivals. Some groups met on a more regular basis in one another’s homes to study the Bhagavad Gita or conduct a puja. Eventually, these immigrants began to think on a grander scale about raising the money to build full-scale Hindu temples. In order to succeed, the scattered Hindu communities and regional societies had to begin to work together.